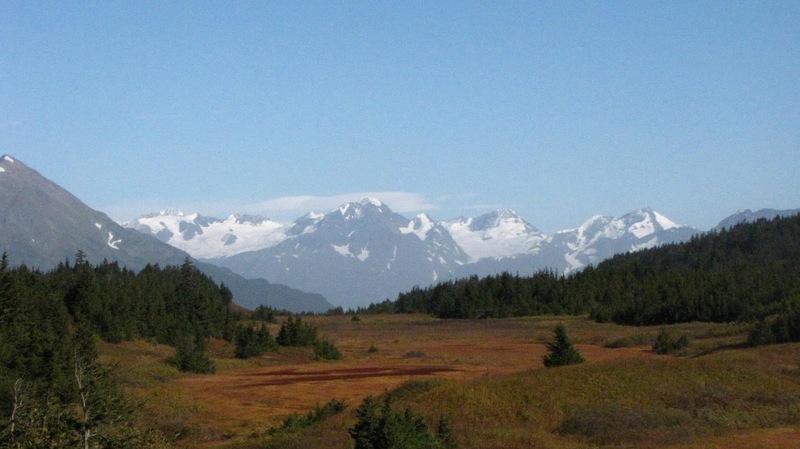 It's the land of fruits and nuts with a tidal Pacific Ocean shoreline of 3427 miles including small bays and inlets. It has a budget so toxic that it must certainly qualify for some kind of Superfund status. And of course it has The Governator. It seems there are a lot of people who have issues with California these days. Too liberal! Too many illegal immigrants! Too many fruits and nuts! They despise California and everything it stands for. However, that does not describe me. In fact, I LOVE CALIFORNIA! There. I've said it. Scary but true. 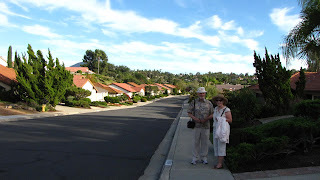 I am fortunate these days to have two very dear friends living in San Diego who graciously allow me to invite myself to visit them whenever I want to. They give me my own little guestroom and bath and computer access. 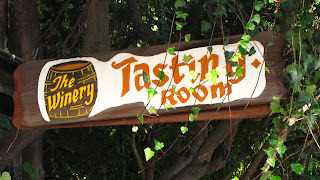 Plus, it is a scant 2-minute downhill walk from their home to a small winery. It doesn't get much better than that. They don't live near the beach but the distance is a small obstacle easily overcome. Of course, the first thing we did yesterday after my uneventful 440-mile drive from southern Utah was to mosey on down to the winery. It was near closing when we walked in (I had been thinking up schemes that morning with MY TRAVEL AGENT for a possible post-Katmai adventure again next summer, and so had left St. George later than I'd planned) but we were able to buy a bottle of chardonnay and sit on the winery patio in the waning light of our late October evening. 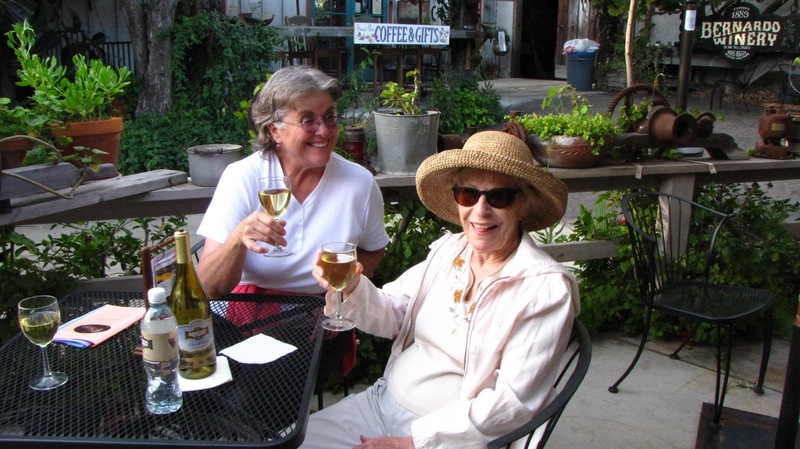 We caught up with each others' news until the last drop of wine was gone. We talked about our summers, our families, and our plans. 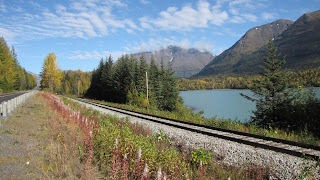 I told them stories about Alaska and they told me about a trip to New England they'd taken in May to re-connect with estranged relatives. We thought of some activities we could do while I am here - sift through tailings at a tourmaline mine, go tide-pooling at La Jolla, visit the aquarium, and hike some of the geology of San Diego county. Knowing us, we're most likely to do all those things and more. We'll find our way to the beach somehow. Cheers! Since my last post (“Field Tripping,” Oct 20, 2010) I have been doing a bit of thinking (ooh, that’s scary) about what I had written. What was that post all about? I strive (honestly, I do strive) to make my writing mean something and not just be a collection of groovy images - well, unless groovy images are the point, such as with the bears of Katmai. But what meaning could anyone without a geology background possibly derive from “Field Tripping?” Could those anyones (and you know who you are!) even decipher what I was trying to say? For that matter, what was I trying to say? I finally realized that there was no context; it was all a mumbo-jumbo-gumbo and that was about it. For sure, I had included lots of nice photos of geologic structures commonly found in southwestern Utah and the surrounding environs, and by inserting some cool lines and boxes into the photos I thought that would explain everything to everyone. But finally I figured out that wasn’t enough. The pictures were awesome but they probably didn’t mean anything to anyone except me and the folks who were on the field trip. Beaver Dam Mtns. as seen from the Virgin Mtns. 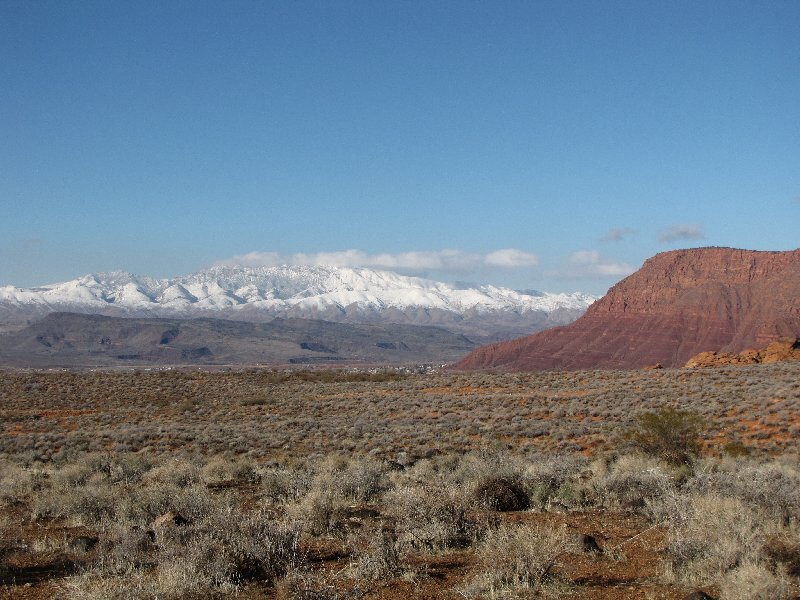 I live here in southwest Utah. I have spent the better part of the past fifteen years looking at its rocks; the first ten were spent wondering how in the heck geologists actually know all this stuff they know, and the next five were spent sitting in a classroom, studying my buttons off trying to understand at least some of that “stuff.” I spent upwards of three years doing undergraduate field research in the Beaver Dam Mountains, mapping the ≈1.74 billion-year-old metamorphic rock outcrops in my study area and trying to figure out what it all meant. I followed Mark C. everywhere and asked questions until both of us were blue in the face. 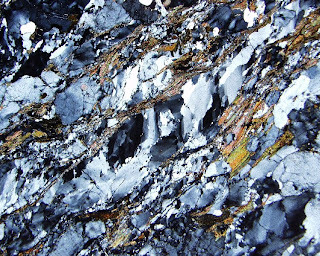 I started by mapping outcrops of amphibolites (metamorphosed basalts) and continued mapping migmatites (partially melted metamorphic rocks from deep within the Earth’s crust), schist (a metamorphic rock in which its minerals exhibit foliation like the layers of an onion) and gneiss (a metamorphic rock exhibiting alternating light and dark bands of foliated and less-foliated minerals). I hammered out hand samples of rocks from the outcrops; took gps readings; drew pictures in a field notebook; took strike and dip measurements (the orientation of an inclined rock surface) with a Brunton compass on every possible outcrop that displayed anything even remotely resembling a flat bedding surface; filled multi-gigabyte cards worth of digital photographs; took my samples from the field back to the lab where I made hundreds of thin section slides which I examined under a petrographic microscope; and with Mark’s help identified the multitude of minerals displayed within the .03mm-thick rock sliver. My favorite classes were mineralogy and igneous-metamorphic petrology because it was in these classes where I started to put “it” all together. 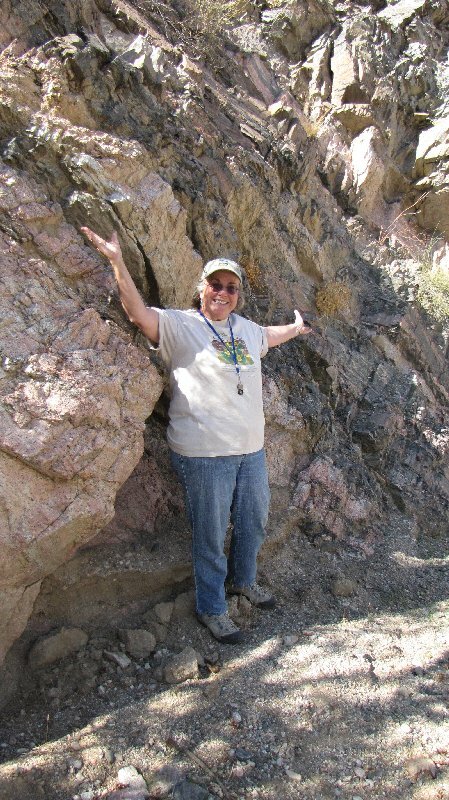 My last summer at field school tied “it” all into a bow as I mapped many of the sedimentary, igneous, and metamorphic rocks that comprise this little corner of the Colorado Plateau/Great Basin transition zone. Now I realize that many of you reading that post were probably wondering “What in the world is she talking about?? ?” You may even be asking that very question right now. So I’d like to explain by starting at the beginning. Well, not at the Big Bang beginning – you have Discovery Channel and PBS Nova for that. First I want to define the 3 different types of rocks. You probably already know them (I know you do!) but we’ll just do a quick review anyway. Next we’ll get oriented to this Colorado Plateau/Great Basin transition zone that I keep raving about, and then we’ll just take it from there. My goal is that the photos taken on last week’s field trip will become less of a mumbo-jumbo-gumbo to you. I sincerely hope you enjoy this particular geologic journey and that you find it all as interesting as I do. Who knows where we will end up! If you have any questions or comments please do not hesitate to tell me because I love feedback. The photos are all mine but the diagrams were gotten off the internet. Unless specified, the text is all from my head and notes I’ve taken over the years. Will there be a quiz on this? Sedimentary rocks form from fragments or particles (“clasts” in geologic lingo) eroded from somewhere else. 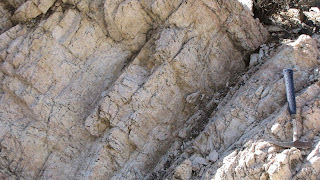 Limestone, sandstone, and shale are all examples of sedimentary rocks. Igneous rocks form from magma which is molten or melted rock from deep within Earth’s mantle (Hey – wake up! Remember crust-mantle-core layering from those Nova programs?). Lava is magma that has erupted onto the Earth’s surface. Basalt (like in Hawaii) erupts above ground, cools quickly, and has no crystal formation (it is fine-grained). 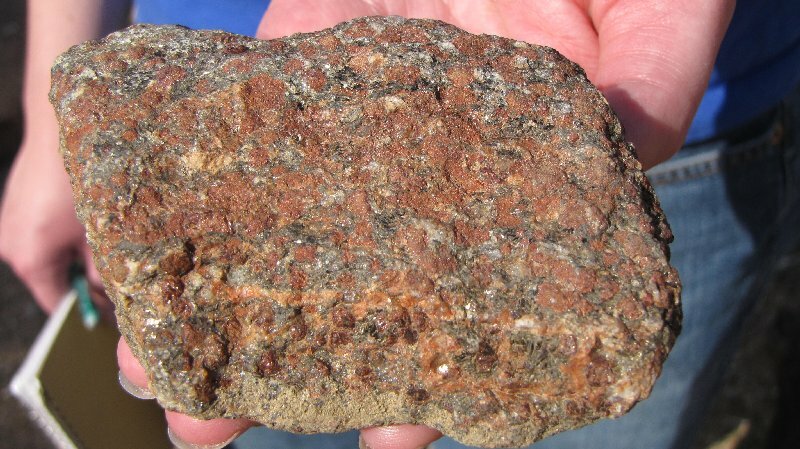 Granite (like in the Sierra Nevada Mtns) doesn’t erupt above ground but cools slowly underground and so has time to form crystals (it is coarse-grained). The pumice of Novarupta was “frothy magma” that contained massive amounts of gas when it exploded. Metamorphic rocks (my favorite!) are those that have been altered by heat and/or pressure. Schists and gneisses are examples of metamorphic rocks. We try to figure out what they were in the distant past by examining their mineral composition today. There are thousands of fascinating yet confusing pressure-temperature diagrams to help in this effort but this too is another story for another time. 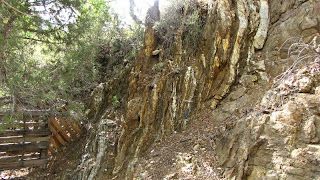 Additionally, there is a geologic principle called “original horizontality” which describes how rocks are deposited. Gravity is the ultimate driving force here, and so those eroded particles or clasts (of sandstone, limestone, whatever) must be deposited horizontally. If any kind of rock is tilted, folded or faulted, as they are in mountains, something happened to bring them to that configuration. How that something happened to bring about the tilting, folding or faulting of the rock layers can best be explained by plate tectonics. Plate tectonics theory holds that the lithosphere (the crust and upper mantle) is divided into a number of brittle plates which move about on the surface of the Earth relative to each other and interact at their boundaries causing seismic and tectonic activity along these boundaries. What this means is that the brittle plates of the Earth’s crust move about relative to each other and cause, among other events, earthquakes and volcanoes to occur and mountains to form. This is the something happened to our flat-lying rocks. Now put on your Physics hats for a moment. Subduction occurs when a denser plate collides with and dives or “subducts” beneath a less dense plate. 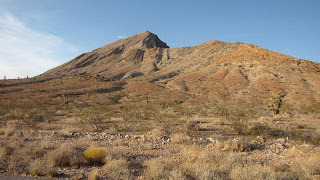 In this manner, some of the rocks from the less dense plate are pushed up to form mountains while the others that were subducted deeply enough then melt and eventually rise as volcanoes. We see this along the Oregon-Washington coast as well as in Alaska. I used this diagram in my evening program this summer at Katmai. You can see that the plate on the left (oceanic lithosphere or Pacific plate) is subducting beneath the plate on the right (continental lithosphere or North American plate), a mountain range forms (#14) as the N.A. plate is pushed up, and rocks subducted deeply enough to melt (#12) rise as magma (# 13) to become a volcanic arc. Viola! And so we have the Cascades with Mt. St. Helens and Mt. Ranier; we also have the volcanoes of the Aleutian Islands and Katmai National Park. FYI: #5 and #6 show where two plate diverge or move apart such as occurs along the mid-Atlantic Ridge. Here's more than you probably want to know at this point: The mechanism for subduction is convection! Like a pot of water set to boil on a stove burner, heated magma rises to the surface from deep within the Earth (#4 and #5), cools at the surface, then descends again to depth - this movement of heated/cooled magma is thought to contribute to plate motion. A common type of fault is called a normal fault in which the hanging wall drops down relative to the footwall (block diagram on left). These occur as tension stretches the brittle crust to the point of failure. 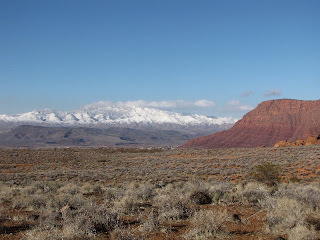 This is a major type of fault that separates the Colorado Plateau from the Great Basin – in southern Utah it is called the Hurricane Fault and it runs from near I-70 south across Grand Canyon where it disappears near Kingman AZ. 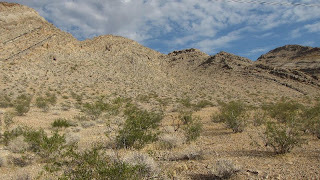 extended or stretched) and older rocks are “thrust over” younger rocks. Think of a rug on a hardwood floor – if you push on one end of the rug, what would happen? The rug would soon fold over on itself over and over again. This is pretty much what can happen when continents collide (wasn’t that the name of some B movie?). 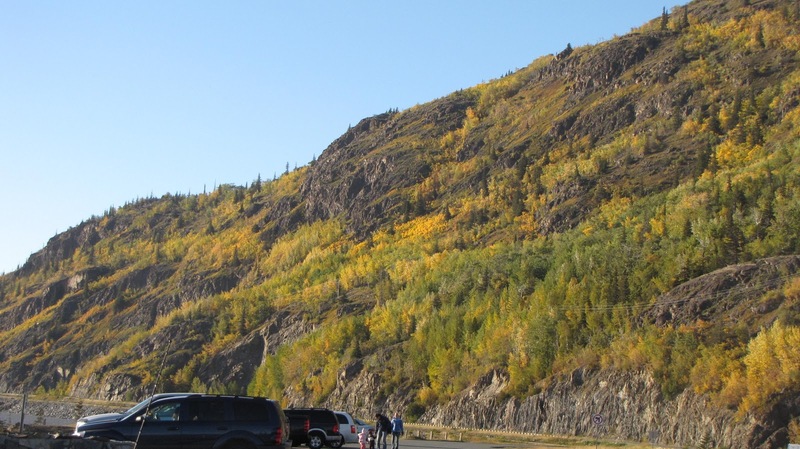 Thrust faults are a type of reverse fault and often occur in mountain building events. 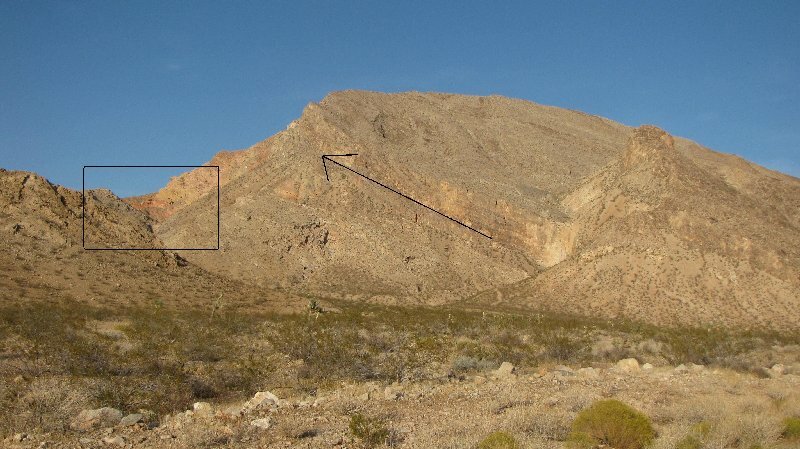 On last week’s field trip we saw this type of fault where the 240 million-year-old Permian limestones had been thrust over younger Early Jurassic (≈ 190 million-years-old) Aztec (Navajo) Sandstone. Just remember that the older rocks are always on the bottom unless something happened. This is another of those geologic principles that is pounded into students from day one. A ramp fault is a small thrust fault – there is a picture of one from the field trip with a cool and groovy box pointing it out. Sometimes, the relative motion of plates to each other is sideways in opposite directions – this is called a strike-slip fault. 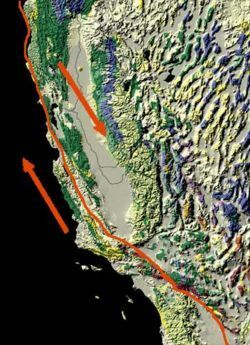 A world-famous example is the San Andreas Fault in California where the Pacific plate is sliding northwestward while the North American plate is moving westward. In this image the relative motion along the fault is shown. The action of the two plates along the SAF is thought to be partly responsible for the thinning crust and fault-blocked mountains of Nevada and the Great Basin (right side of image) – as the Pacific plate moves northwest it shears and draaaaaaags the western edge of North America with it. The crust is so stretched and thinned in Nevada that it is thought to be only a few miles thick there. The relative movements of the SAF have been occurring for about the past 20 million years. Prior to that, the tectonics was different along the west coast - the oceanic plate was moving eastward, carrying along land masses that would eventually collide with North America. 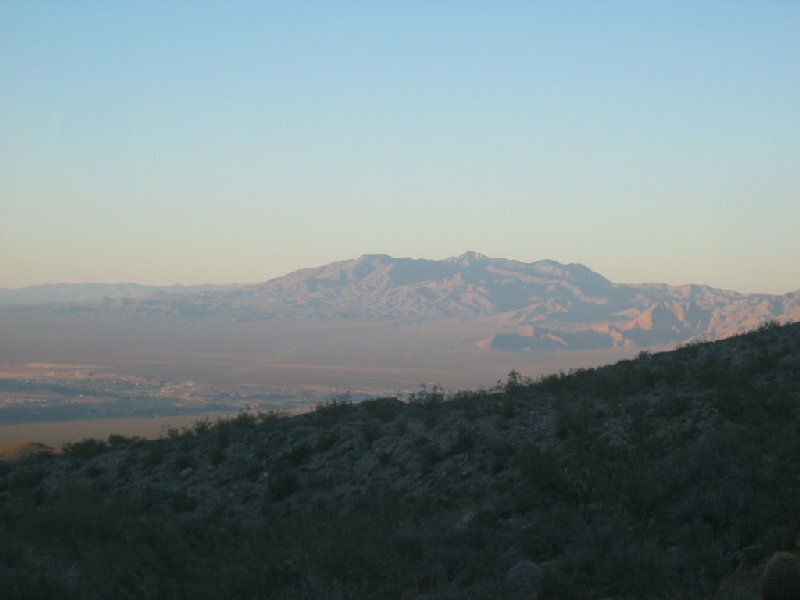 A period of mountain-building lasted from about 140 million years ago until about 35 million years ago. 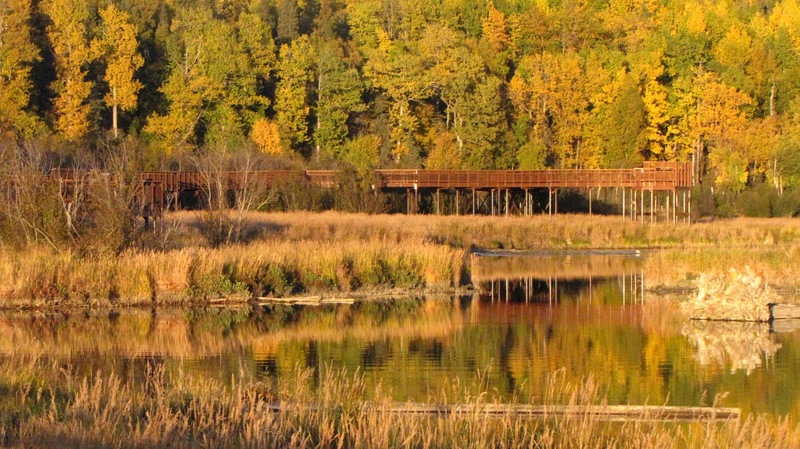 It is during this time that many of the structures seen on field trips in the Beaver Dams and Virgin Mtns. came to be. That’s enough of plate tectonics for now! It’s time to get oriented. I had two lovely red stars to indicate the location of St. George in southwest Utah on these maps but sadly I couldn’t get them inserted. What a drag. 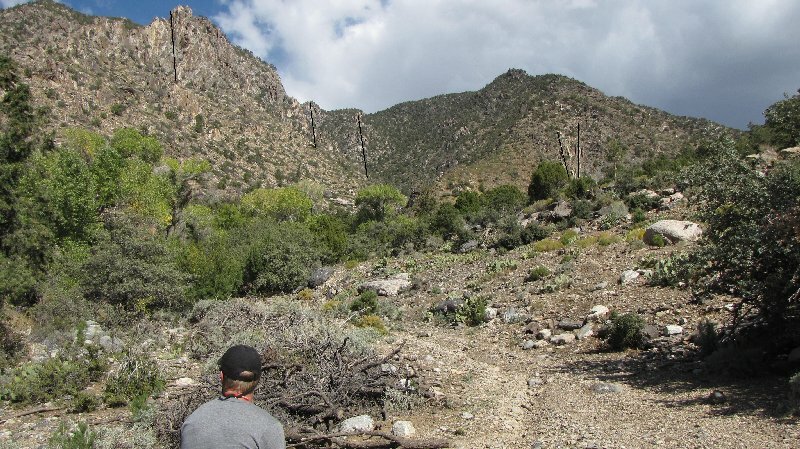 But with your keen observation skills you can still see that our area of interest is smack-dab on the boundary of the Colorado Plateau and the Great Basin – the transition zone between the two. Cedar City is close enough and also in the transition zone so let’s go with it. 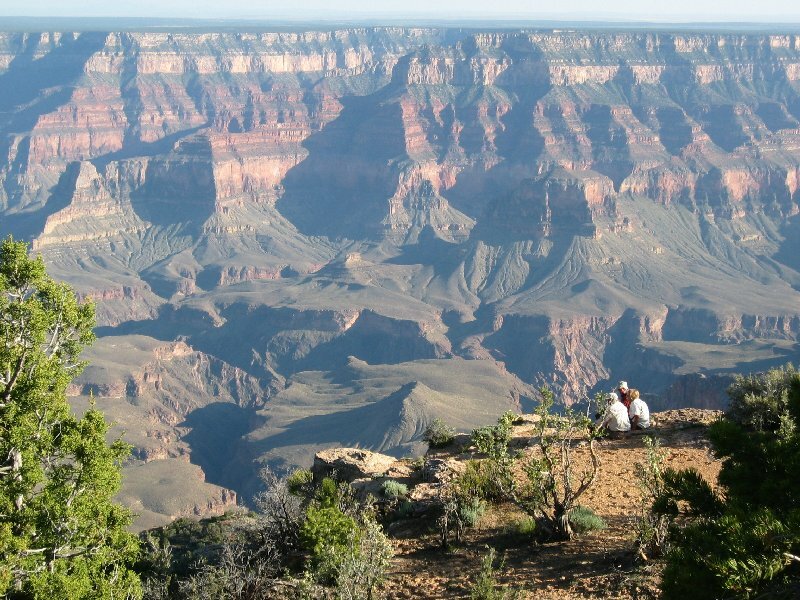 The Colorado Plateau consists primarily of flat-lying sedimentary rocks that have, over the past several hundreds of millions of years, undergone very little tectonic activity – it is considered a fairly stable part of the continent. It does have a slight dome shape due possibly to melting of crustal rocks deep beneath it but that is another story for another time. 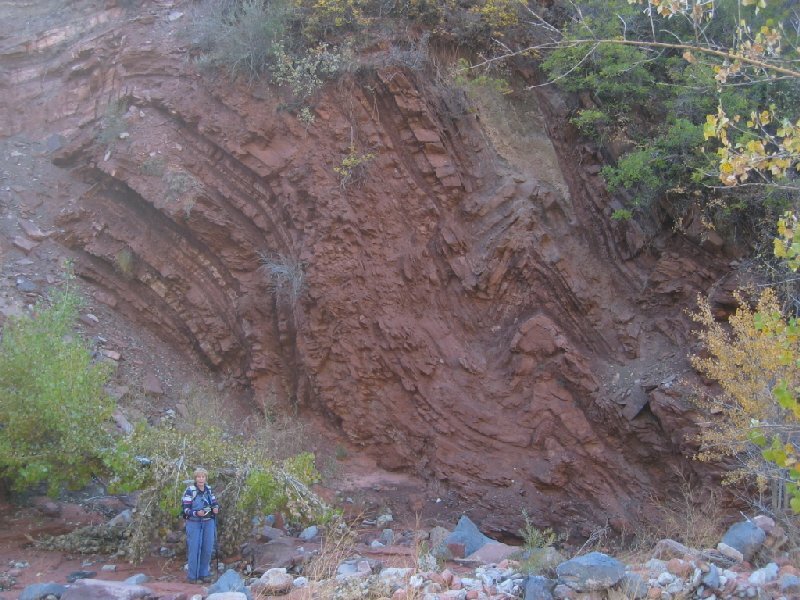 However, many areas along the western and southern edges or boundaries of the Plateau have undergone much compression and uplift or extension and faulting over geologic time as landmasses of different size and composition have collided into and attached themselves to or “accreted” onto the more stable core. 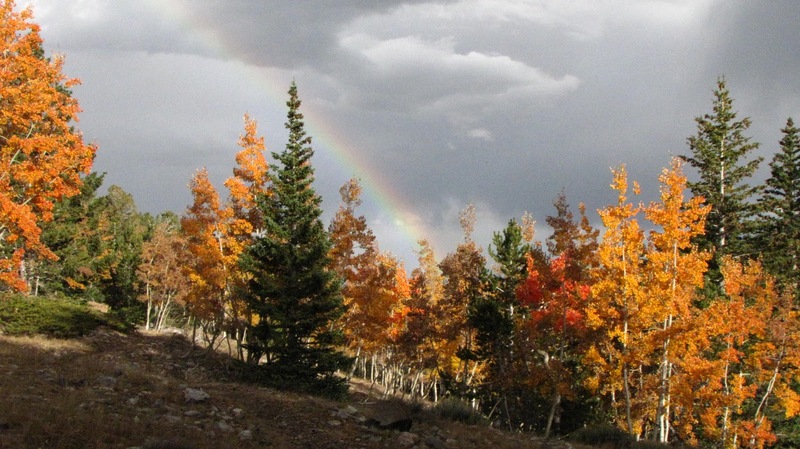 What does your mind’s eye see when you think of the Colorado Plateau? 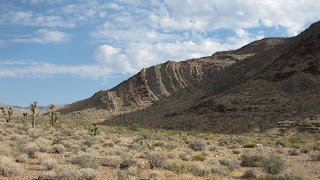 “Layer-cake stratigraphy” is a common description of its sedimentary rocks that have maintained their horizontal configuration pretty much intact since they were laid down millions of years ago. These rocks are a window into the past; they tell of advancing or retreating shallow sea floors, coastal plains, flood plains, mud flats, lagoons, inland freshwater lake beds or massive fields of desert sand dunes. 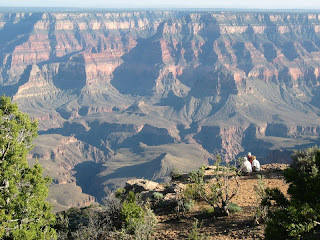 Grand Canyon AZ is the textbook example of flat-lying sedimentary rocks of the Colorado Plateau. This is a view from Pt. Sublime on the North Rim (probably one of the better photos I have ever taken!). 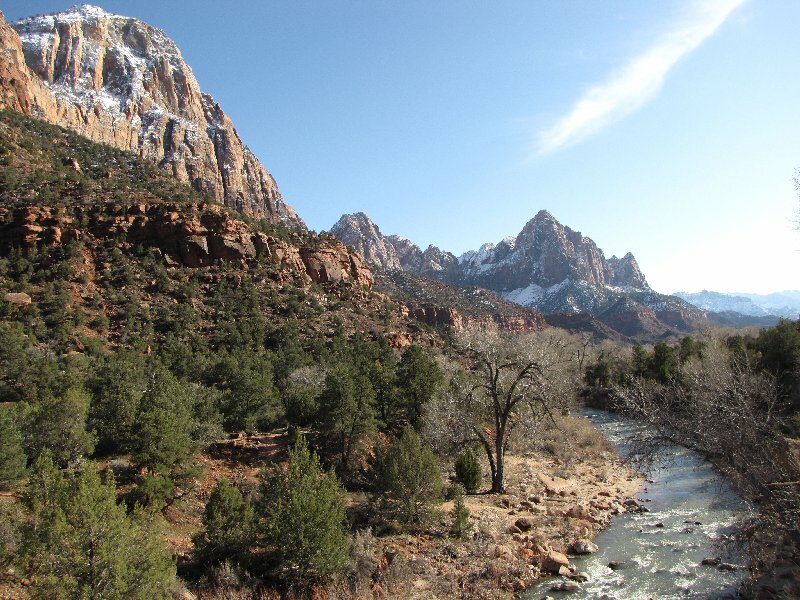 All of the well-known national parks in Utah are on the Colorado Plateau – Zion Canyon, Bryce Canyon, Arches, and Capitol Reef as well as Grand Staircase-Escalante National Monument and Cedar Breaks National Monument. Zion is actually on the eroding western edge of the Plateau and so is considered to be in the transition zone. 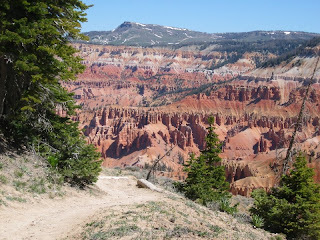 Cedar Breaks is also on the eroding western edge of the Plateau –a barely distinguishable drainage divide along the park road sends run-off draining eastward ultimately into the Colorado River while run-off draining westward goes into the Great Basin. 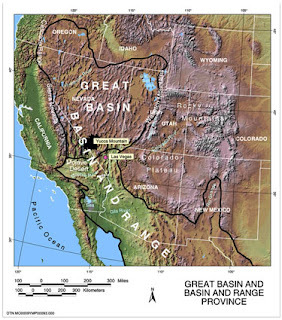 The Great Basin bounds the Colorado Plateau on the west and encompasses western Utah, most of Nevada, parts of Idaho, Oregon and California, along with a tiny corner of northwestern Arizona. If you have a highway atlas handy, take a look at Interstate 15 as it cuts north and south through Utah. This road pretty much marks the boundary between the Colorado Plateau and Great Basin as it divides the state nearly in half. 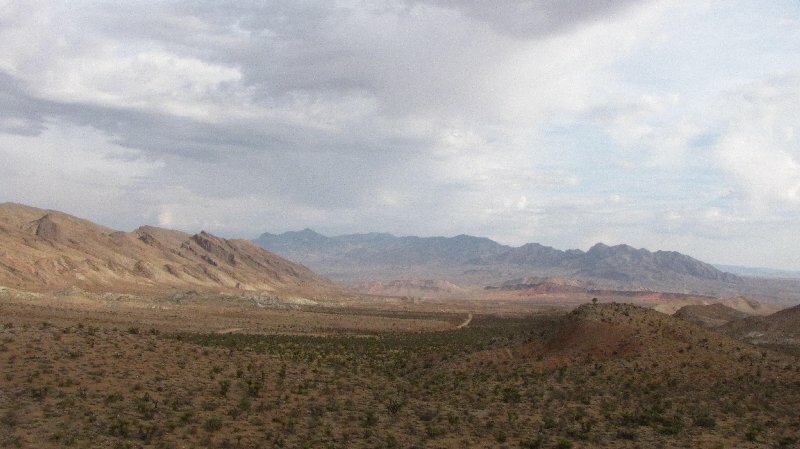 Interstate 15 also generally follows a nearly billion-year-old fault line in the crust, so it is not really surprising that the boundary between the Great Basin and Colorado Plateau is located exactly here. Over the course of those three years of metamorphic rock-hounding and thin-section grinding, Mark (mostly) and I (leastly) worked out some ideas of what had gone on over the past nearly 2 billion years. We came to a number of conclusions which continue to be refined. Field work continues sporadically as we are able to get out to the study area and map. 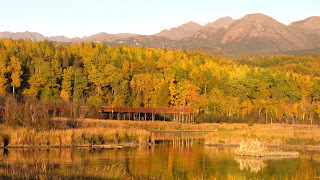 I am no longer a student but maintain a nearly obsessive interest in the area. Can you tell? 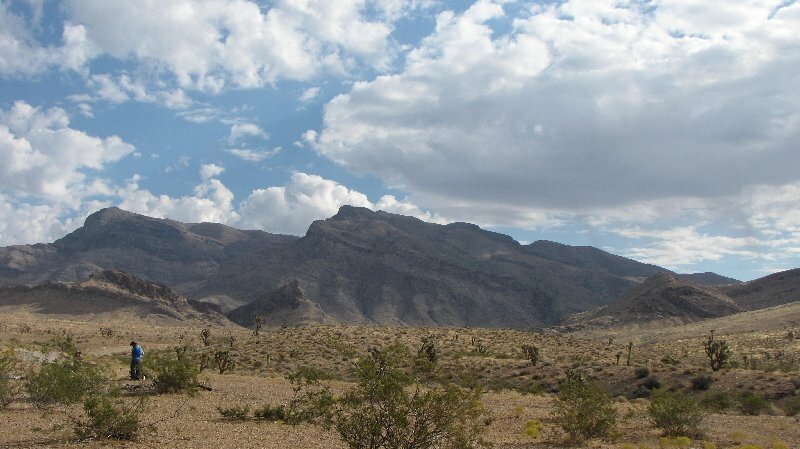 The metamorphic and tectonic history of the Paleoproterozoic (1600 to 2500 million years ago) assembly of North American continental crust is preserved in ancient crystalline basement rocks of the southwestern US - for instance, at the bottom of Grand Canyon along with these outcrops found in the Beaver Dam Mountains and Virgin Mountains. 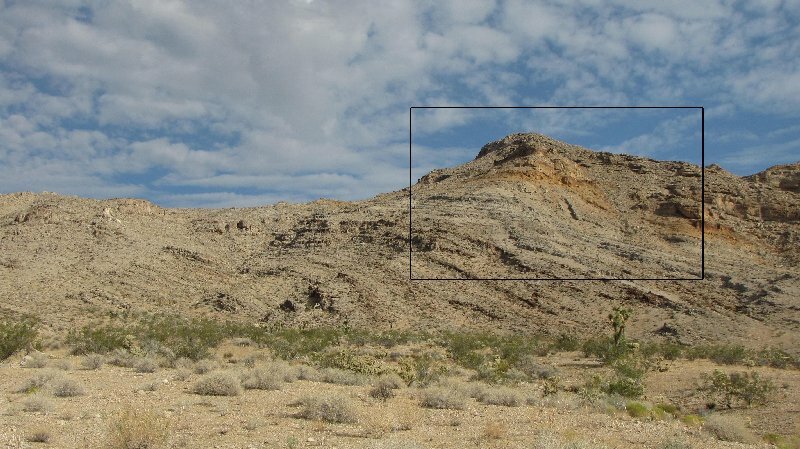 We found that our field mapping and thin section analysis delineated a massive shear zone extending for tens of miles through AZ-NV-UT. 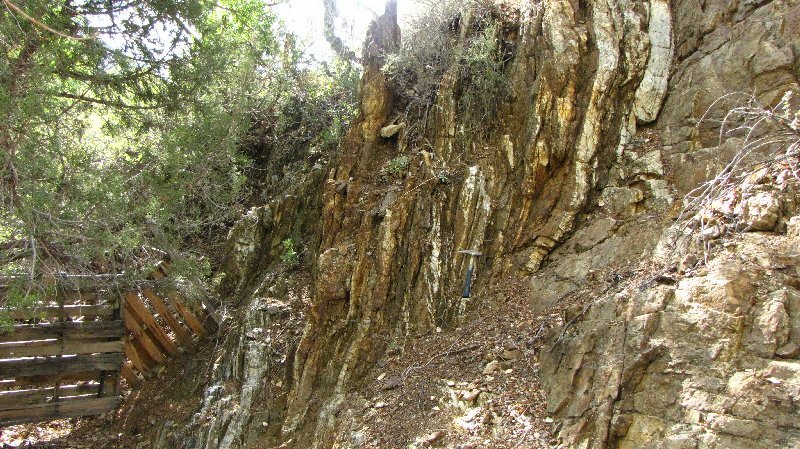 This shear zone exhibits different mineral assemblages and exhibit diverse textures. These textures (seen on the thin section slides under the petrographic microscope) tell much about the shearing and decompression (uplift) that different tectonic blocks have undergone from deep within the crust and possibly the mantle to the surface over the past ≈1.7+ billion years. Mineral studies suggest that these rocks came from depths near 27-29 miles (45-48 km). This is why that “shear zone” in the Virgin Mtns. photographs is so beguiling. To be able to get “up close and personal” with a shear zone in which the shearing occurred deep within the crust (because we are talking not about brittle, upper-crust rocks but about plastic-flowing, lower crust rocks) just blows me away. 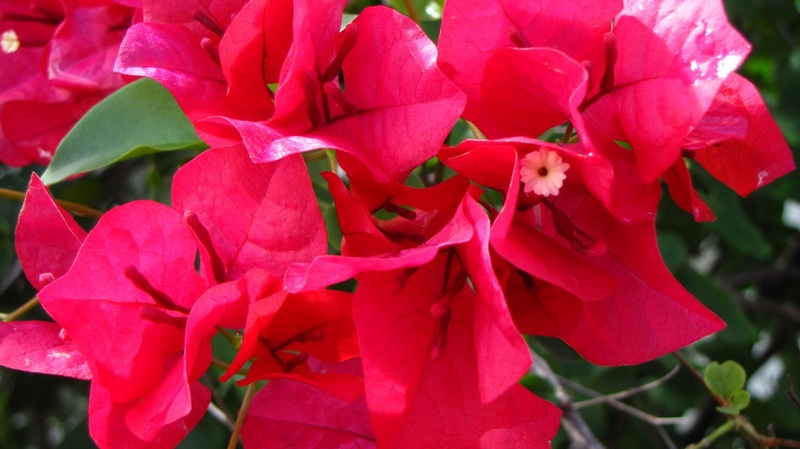 Most earthquakes are shallow, brittle affairs – no disparagement meant here! – while these shear zones involved nearly inconceivable pressures of 188,549 pounds/square inch and temperatures approaching 1472°F (800°C). And that ultramafic pod at which the students were milling about is thought to have been brought up during tectonic collision from mantle depths of possibly 34-35 miles (56-57 km). Remember earlier in this post I talked about different size land masses colliding with or “accreting” onto what already existed as ancient North America? The evidence Mark and I and others found here in the southwestern Utah/southeastern Nevada/northwestern Arizona transition zone suggests to us that an ancient landmass referred to as the Mojave Province (think Mojave Desert) most likely accreted onto another ancient landmass referred to as the Yavapai Province. There is much debate (of course) about what accreted on to what, and when. But it is fairly certain that something happened those billions of years ago and that it occurred in this area. A mountain building event called the Sevier Orogeny (orogeny means “mountain building”) occurred ≈140 million to ≈ 35 million years ago; during this time more landmasses were “rafted in” from the west as the oceanic plate collided with and was subducted beneath what already existed as North America. This lengthy event resulted in folding, faulting, thrusting up and generally wreaking serious tectonic turmoil on a good many of these rocks. 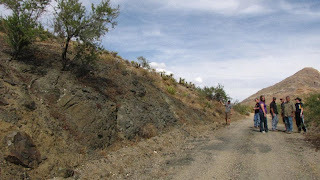 That is why, for instance, those ≈ 240 million-year-old Permian limestones we saw on the field trip are thrust over Early Jurassic (≈ 190 million-years-old) Aztec (Navajo) Sandstone. 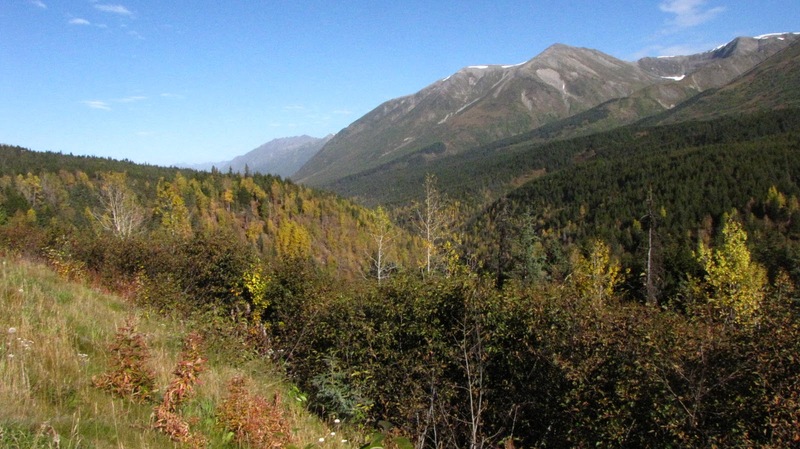 At the completion of the Sevier Orogeny, tectonics took a breather for a few million years. 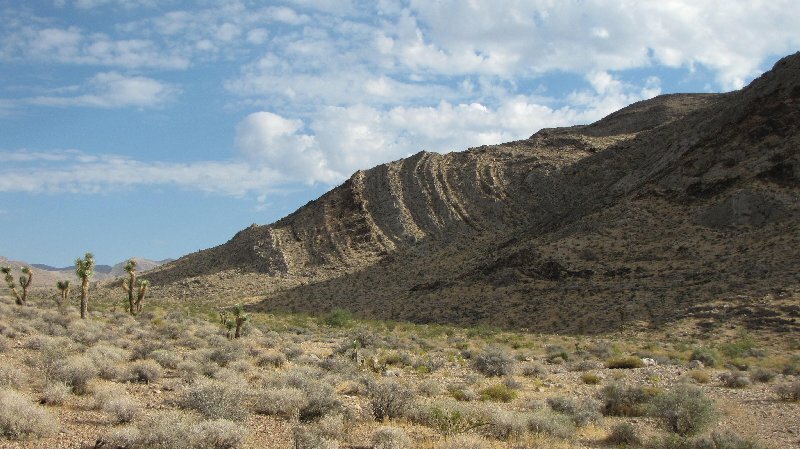 Ultimately the plate configuration changed, the San Andreas Fault came into existence, and the western North American crust stretched and normal-faulted its way to the Great Basin/Basin and Range Province marching caterpillars that we see today. I am leaving a whole lot of the story out, so if anyone is interested in learning more, just let me know. My hope here is that those images from my field trip last week will now be less of a mumbo-jumbo-gumbo and will make more sense to you. Take another look at them, if you will. And know that I am always more than happy to go out and take more, wherever I go! No, wait. 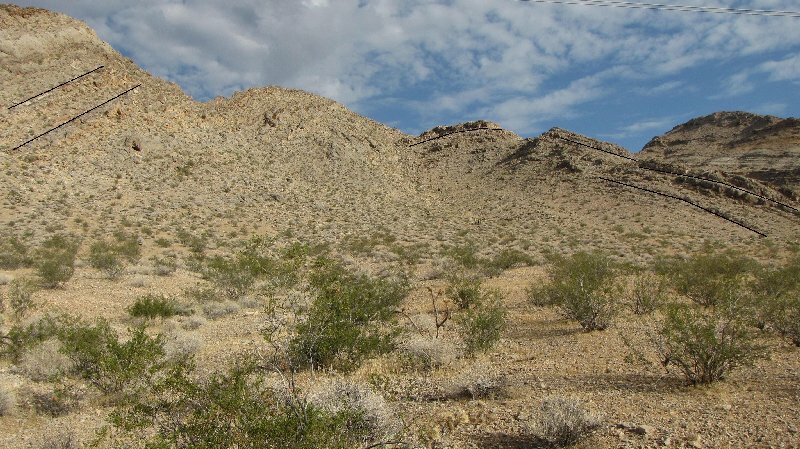 Maybe some of you non-geologist types might want to take your chances and just fall asleep when you find out what this blog post is about. Or perhaps there is a sock drawer that needs rearranging, or a refrigerator that needs defrosting, or a roof that needs reshingling. Something! Anything! Anywhere! Isn’t there anything else you can find to do besides read about my favorite subject? And what is that subject? You guessed it – GEOLOGY!!! Ah, but... This is what I'm all about. I can't help it! Sadly, I was told that in a recent blog on rhyolite I had probably lost 95% of my audience. Please - tell me it isn't true! 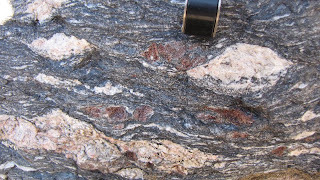 In my opinion (and it is my blog, after all) there is nothing quite as exciting as rocks nearly 1.8 billion years old, surrounded by other rocks even older. Over countless millennia the crust of the Earth has been subducted and sheared, lifted, tilted, thrust forward, stretched back, and otherwise undergone all sorts of tectonic gymnastics so that what we have here and now is my backyard – the Colorado Plateau/Great Basin transition zone of southwestern Utah, southeastern Nevada, and northwestern Arizona with its mind-bending scenery of jagged mountains, elongated valleys, stair-stepping plateaus, and endless vistas. When I was in school studying geology I went on every single field trip I could fit into my schedule. 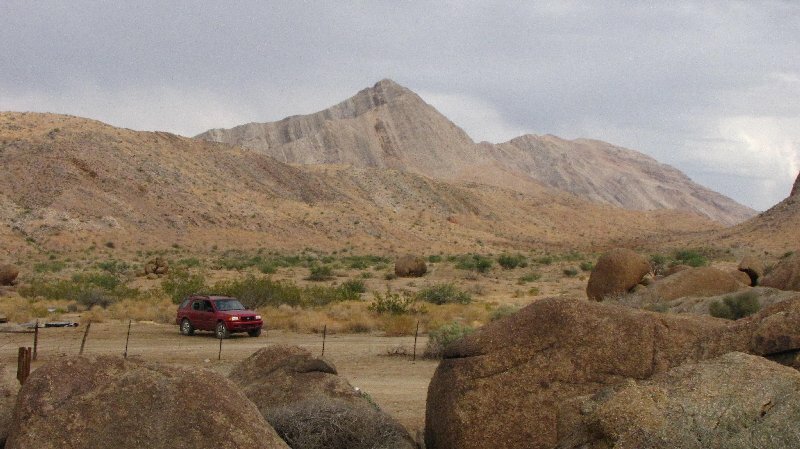 I also spent a lot of time, nearly 3 years, studying these very ancient rocks found in the Beaver Dam and Virgin Mountains outside of St. George, UT. And I still go out there because of the fascination these rocks hold for me. This past weekend was no exception as I tagged along on a 3-day SUU field trip with Mark, my old professor, and a group of his current students. I did not have to take notes, I would not be quizzed, and I left the driving to someone else. I went along for the sheer joy of seeing the rocks. I have inserted lines and boxes in some of the photos in order to better visualize some of these really cool structures. Click on the pic and it will enlarge. Enjoy! Garnets in schist, Beaver Dam Mtns. Folded rocks - dark lines show layers tilted in opposite directions, Beaver Dam Mtns. 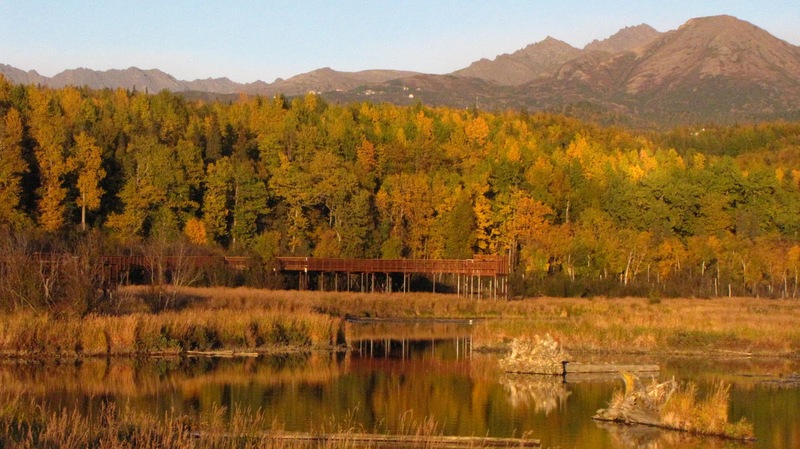 Ramp (a type of thrust) fault, Beaver Dam Mtns. Overturned beds, Beaver Dam Mtns. Isoclinal (tight) fold, Beaver Dam Mtns. Yours Truly at sheared ultramafic darker "pods" (from deep in the mantle) , Virgin Mtns. 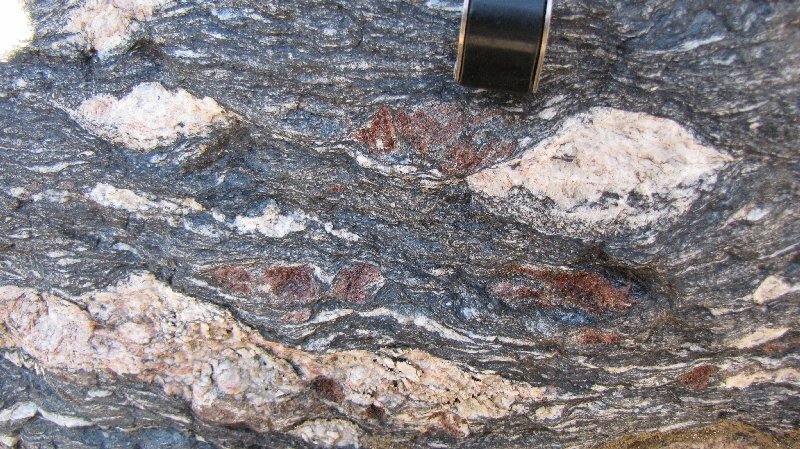 Sheared garnets in leucogranite intrusion, Virgin Mtns. For my non-geologist friends: think white melted rocks with stretched garnets! Sheared garnets (red) and sillimanite (small white) minerals in schist, Virgin Mtns. Check out the sense of shear and plastic flow of the minerals. Shearing up close and personal, Virgin Mtns. Thrusting (from tectonic compression of crust) where older Permian limestones (240 million years old) are thrust over younger Navajo Sandstone (in box), Virgin Mtns. Overthrust bedds of Permian limestones. 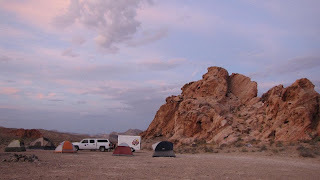 Tilted beds, Gold Butte area, Virgin Mtns. Rocks in foreground are a 1.4-billion year old megacrystic (really big!) granite. Ultramafic "pod" of dark mantle rock. This past week or so I have been pondering quite ponderously how to proceed with this blog. 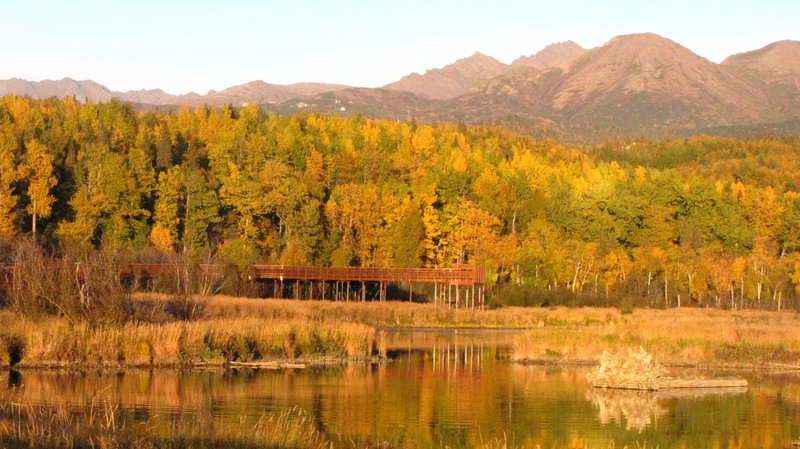 I’ve completed my 5-month summer NPS job at Katmai in Alaska and so the uniqueness of my being in that location has disappeared and I have returned home. Home, however, is the Colorado Plateau/Great Basin transition zone, an area of the southwestern United States of unique geology and jaw-dropping scenery. There are so many extraordinary places to which I can drive in less than a day (and write about!) that it would take a thousand lifetimes to explore them all. Actually, walking or riding a bicycle could get me to some pretty fantastic places, too, but I would definitely need several additional lifetimes utilizing those modes of transport. So I will just keep on traveling and writing about My Backyard (and beyond), and hope that my journeys continue to keep you engaged. A favorite nearby locality of mine is Great Basin National Park near the Nevada-Utah border. This jewel of the desert is barely 200 miles from home and I can drive there in about three or so hours without even having to go through a single stoplight if I route myself through Panaca and Pioche, Nevada. These two-lane roads are given names such as “The Loneliest Highway in the World” and have signs reading “Next Gas - 100 Miles” so you’d better fill up when you can (gasoline and tire pressure) and bring a cooler full of sandwiches and drinks. 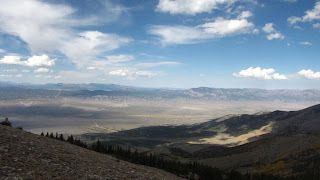 Lehman Caves extends a quarter-mile into the flank of the Southern Snake Range in Great Basin NP. According to the park brochure it was “discovered” and explored by Absalom Lehman in 1885 but of course Native Americans knew about the cave long before any white person ever saw it. 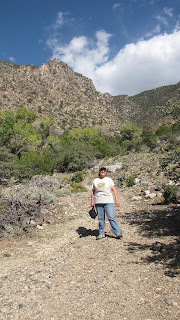 Over the past 15 years I’d hiked in both the Northern and Southern Snake Ranges (the park is in the Southern) and gone on several geology field trips (mainly in the Northern) but had never taken the cave tour. Where have I been??? So last weekend, after being home from Alaska for a grand total of five days, I got my friend Lucy to go along on an overnight “sandwich camping” trip where we’d take the cave tour on Friday, pitch our tents at the 9,886-foot elevation Wheeler Peak Campground, and hike up the trail as far as our little feet would carry us to Wheeler Peak (at 13,063 feet) on Saturday. Lehman Cave is what’s called a solution cave. 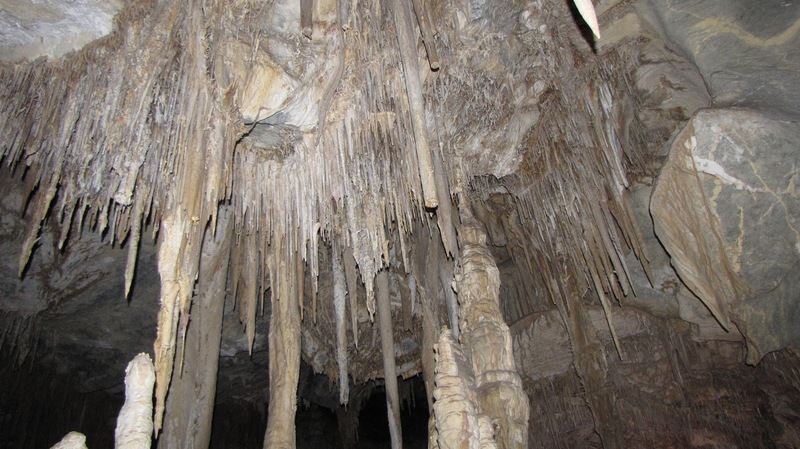 Over hundreds of thousands of years, ancient carbonate limestones, remnants of Paleozoic seas, were dissolved at the water table by acidic surface waters mixed with waters from deep below the surface. This acidic water dissolved the limestones and enlarged openings already present along bedding planes, fractures, and faults in the rock. In this way the caves eventually formed. As the water table dropped over time with the end of the last Ice Age, air-filled caverns emerged. 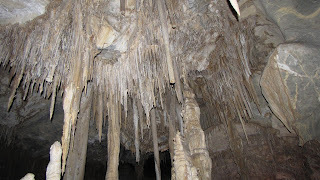 Stalactites, stalagmites and other types of formations were created as dripping waters leaked into the now air-filled caves. 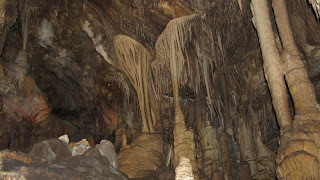 Large thin round discs or shields of calcite are seen throughout the cave system and present a very dramatic sight as they “drip” downward from the dark recesses of the cave’s barely discernible ceiling. 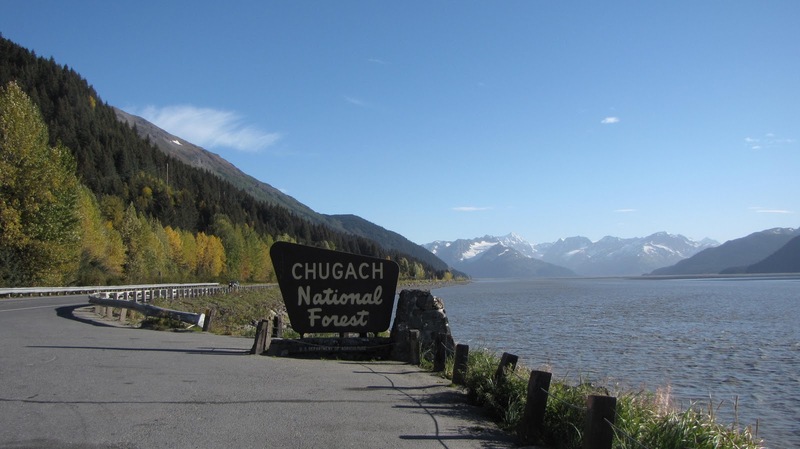 A ranger with NPS guided our the 90-minute tour – only 20 people at a time are permitted and even in late Sept. our tour was full. I had another personal agenda for spending a few days at Great Basin – back in late winter I had applied for a seasonal NPS job there, but by the time they called me (in April) to see if I was interested I had already accepted the job at Katmai. So I wanted to meet with the woman I’d spoken with in April, and put a face to a name so that I would be remembered the next time my application floated across her desk. My efforts paid off and we were able to spend a nice bit of time chatting. I discovered that Great Basin NP has several permanent park ranger positions in addition to their seasonals. So naturally I will watch for the job posting and see what the future brings. 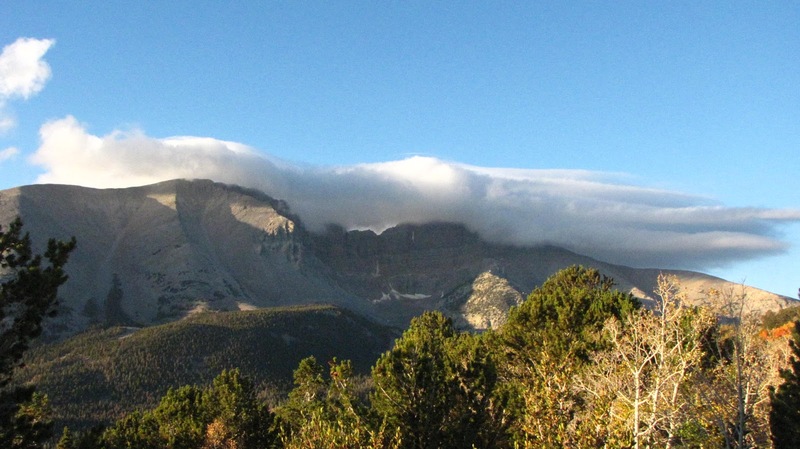 I totally would love to work at Great Basin permanently – it’s close to home and the geology of the region fascinates me. 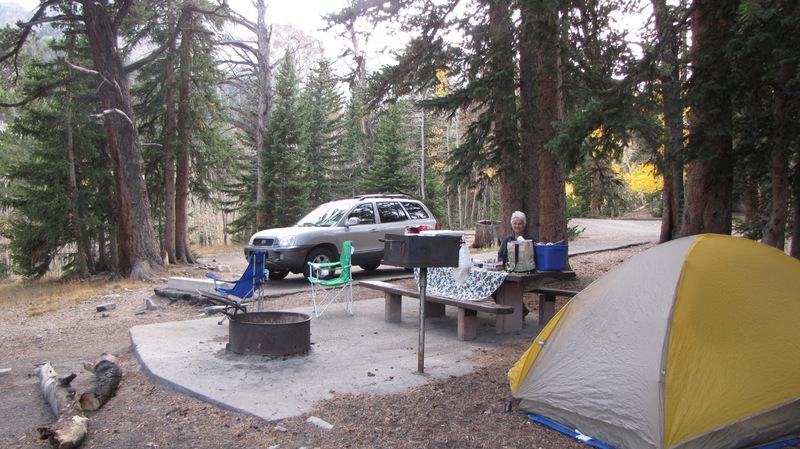 The water at Wheeler Peak campground had been turned off due to cold weather earlier in the month but that didn’t deter Lucy and me. We had a couple gallons between us and planned on heating water only for coffee and hot chocolate. That evening at dinner we ate cold beef out of the can (it was really good!) along with sliced veggies, cheese, and fruit. 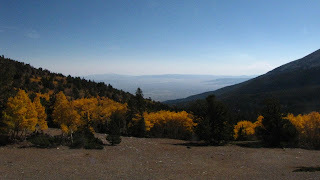 The sky was clear and later I gazed through the spruce trees at the night sky for which Great Basin prides itself. It wasn’t the Valley of Ten Thousand Smokes, but it was pretty good. Wheeler Peak is the second highest peak in Nevada (after Boundary Peak at 13,143 feet). 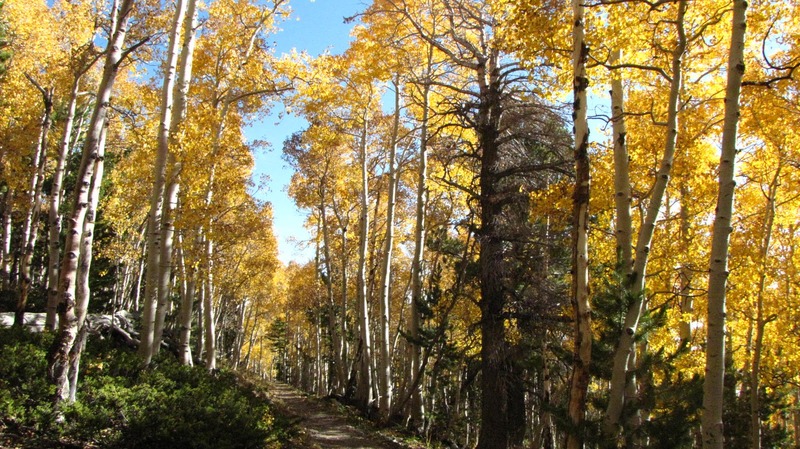 The well-maintained trail, 8 miles round-trip, at first climbs through stands of aspen, reaching timberline where stunted and twisted limber pine and Engelmann spruce struggle to survive. Above timberline the trail becomes more exposed to the elements as it works its way through the bare cobbles and small boulders of quartzite and conglomerates. 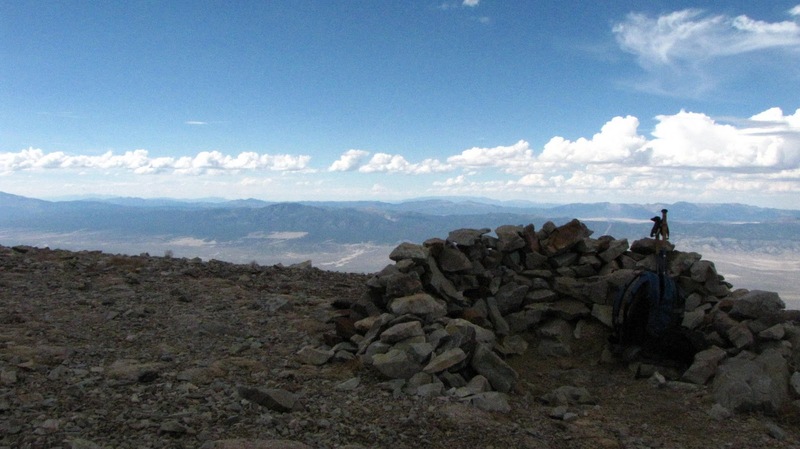 I know the math here: fierce winds + Wheeler Peak = no hike. 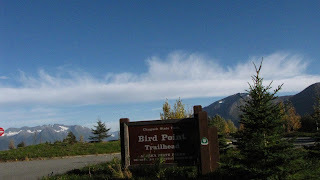 But this Saturday we realized how lucky we were that the wind and sunshine deities favored us, so we enjoyed the far-reaching vistas of the Basin and Range as we continued on up the mountain. There is a remnant alpine glacier on Wheeler that covers only about 50 acres and it is one of the most southerly in the continental US. 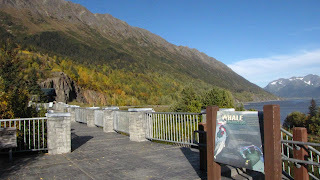 I used to hear stories of people hiking up to the summit of Wheeler and coming down via the glacier. Not this girl! 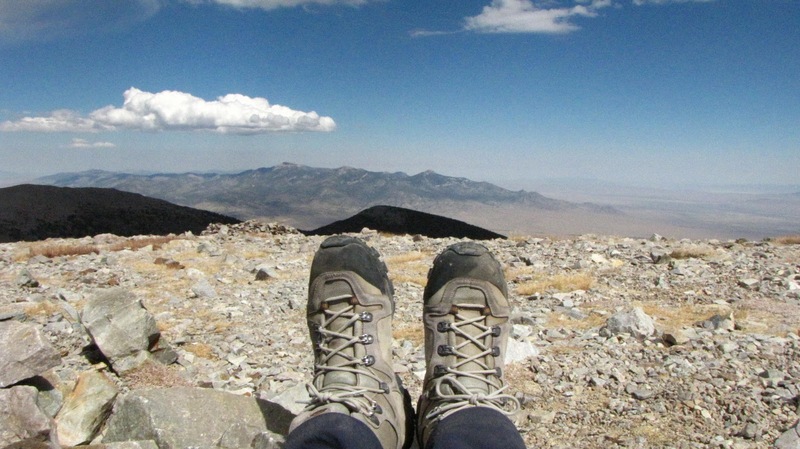 At the saddle (11,800 feet) I wondered where those pesky little oxygen molecules had gone. I was becoming a little lightheaded and so decided that I had gone far enough. Lucy was soldiering on up the trail – having ridden cross-country on a bicycle the previous summer she is in quite better shape than I am. Some three-sided rock shelters had been constructed on the saddle to act as wind-breaks, so I parked myself in the lee of one of them and comfortably ate my lunch. 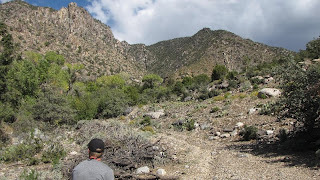 I examined the rocks while I sat, looking for any sheared schists or stretched conglomerates, evidence in the Snake Ranges of what geologist call a metamorphic core complex. 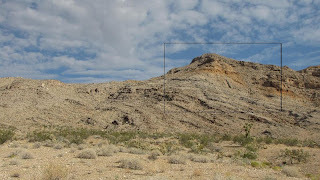 Here, the underlying crystalline rock was arched upwards into a dome during tectonic activity while overlying rocks were stretched into blocks and transported to either side of the dome. 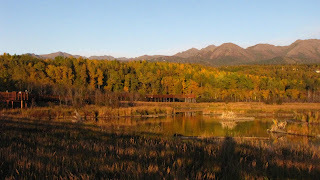 I was gazing into the Basin and Range. Mountains and Valleys as far as the eye could see reached beyond the western horizon across Nevada all the way to the Sierras. 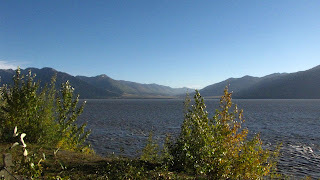 It is a special place, this Basin and Range Physiographic Province. The Great Basin, in which there is no surface drainage of water to the oceans, is enclosed by it. 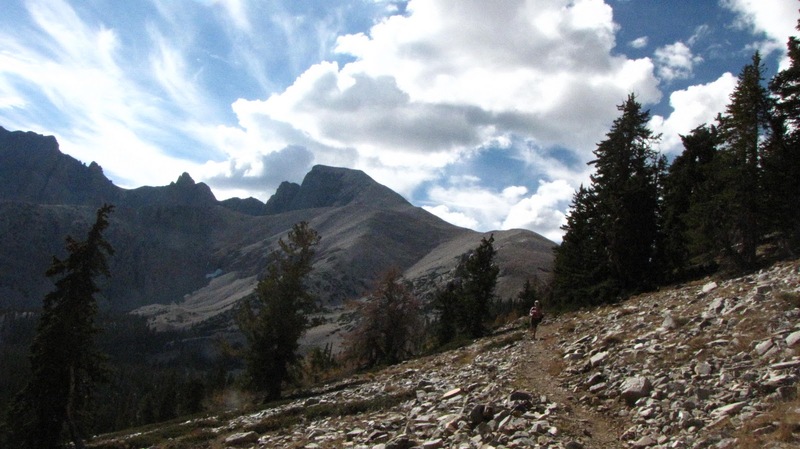 One early western explorer called the mountains of the Great Basin “marching caterpillars” and once you spend some time here you begin to understand why. 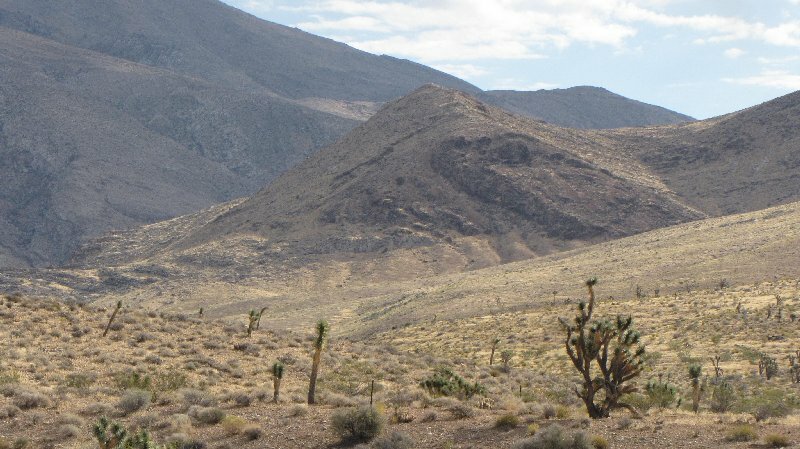 They are oriented generally north-south, and there are upwards of 300 discrete mountain ranges in Nevada alone, more than in all of Alaska. With my binoculars I watched Lucy work her way up to the summit. I received intermittent reports from folks coming down that she was doing just fine. I did consider continuing on up, but when two guys came down and related it had taken them and hour and a half to reach the summit from the saddle I decided it was too late for my assault on the summit since the wind had picked up and there was lightning and thunder on some distant peaks. When Lucy was almost back at the saddle I started down, figuring she could easily catch up with me. 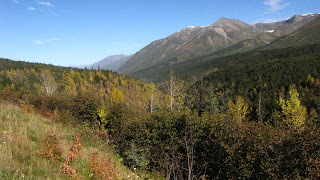 We met up again at treeline, the trail above through the cobbles and small boulders of quartzite giving way to the softer soils in the spruce and then aspens. We came upon four deer on the trail that were not startled by our appearance and seemed not to be bothered by our presence. A small curve of a rainbow followed us down the trail for a few minutes and then disappeared into the clouds. It was cold canned chicken instead of beef for dinner this time. 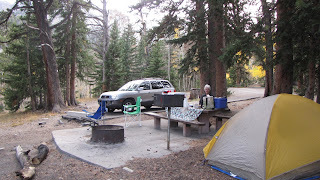 “Sandwich camping” involves no cooking but that night it was cold enough to wish we had something hot to eat. Laziness won out over comfort, however – we just didn’t want to go to the effort to cook. The next morning, though, after a wind-screaming-through-the-trees night we did the time-honored camping thing and just packed it all up and went down the mountain into Baker, NV for a breakfast of eggs and coffee that someone else cooked for us. My goal is to make it to the summit of Wheeler the next time I go, for I know there surely will be a next time. 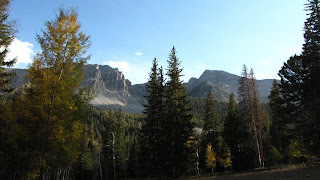 I just can’t help and go back to the Great Basin whenever I can – and who knows? Maybe the future will find me working there. If so, I'll take you on the tour! It's been raining since last night. Am I still in Alaska? Did I merely dream that I came home to Utah? Well, no. Along with the pounding rain has been booming thunder and crackling lightning - something that rarely if every occurs in our 49th state. A storm moved into southern Utah from the west in the early morning hours - last night was crystalline clear, with nearly the sort of Milky Way-filled sky I witnessed at the USGS hut on Baked Mtn. 2 weeks ago. It wasn't quite the same, though. Light pollution from St. George filled the southern horizon, blotting out what stars could have been seen there. But it was still amazing to look up and be reminded of those two star-blazing nights I spent in the Valley of Ten Thousand Smokes. 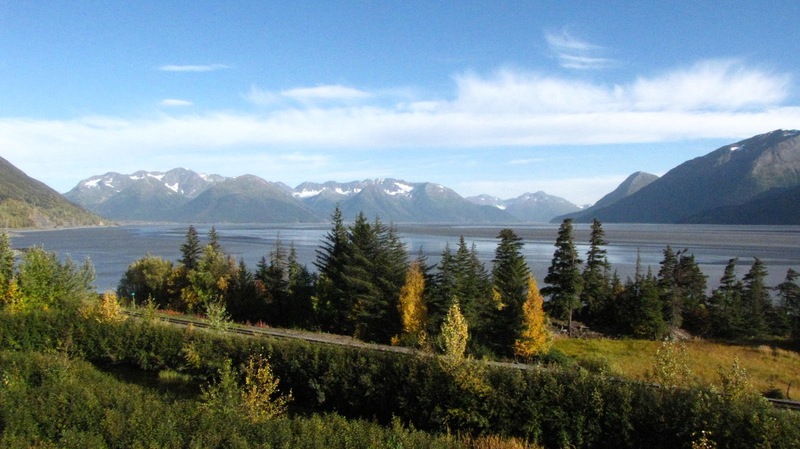 And I promised some pictures of my drive from Seward back to Anchorage, didn't I? 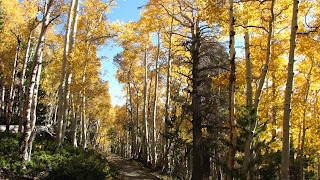 It was a brilliant autumn day with the cottonwoods and aspens glowing golden in the northern sunshine. 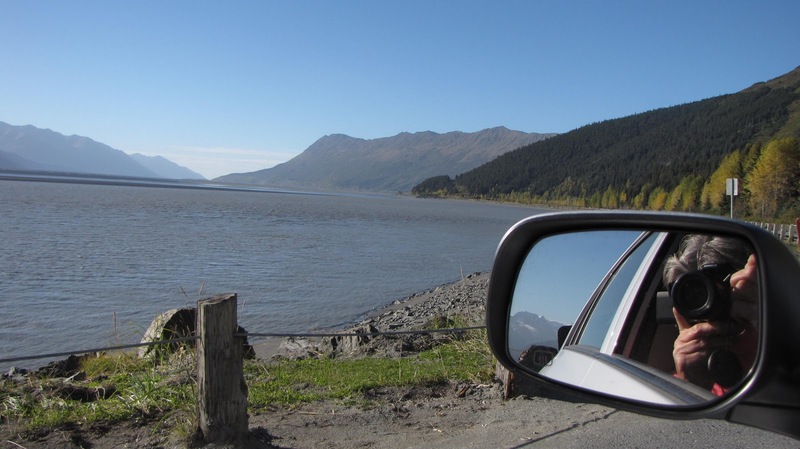 Snapping pix along Turnagain Arm - Yes, I turned the engine off!!! As I moseyed my way on back to Anchorage and eventually to the airport, I stopped for an hour or so at Potter Marsh, south of town. 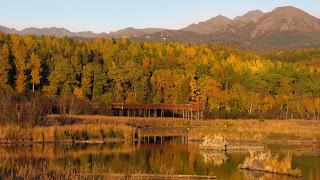 I had been here in April and was lucky to be here again in September. This time I saw a bald eagle soaring close by and two mergansers swimming lazily about. 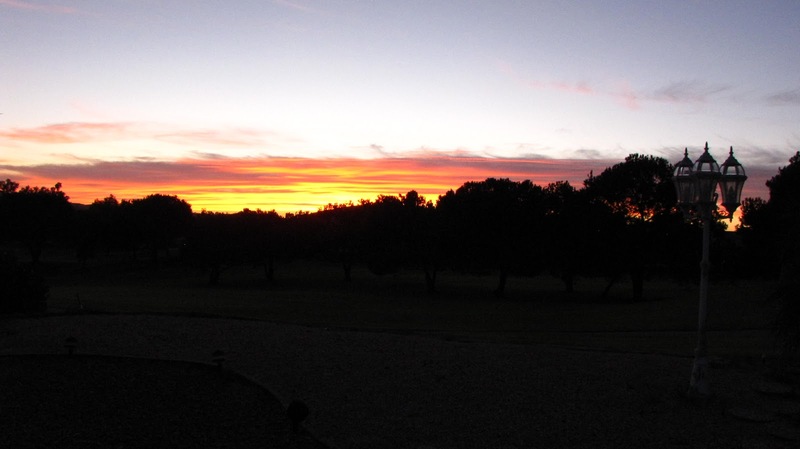 The sun was setting behind me as I took these images.